I do have a crush on aluminium boats, as you may know from my various articles, like my visit to Garcia and Allures lately in Cherbourg. Since I´ve completed my first sailing experience in an aluminium yacht (which was a pretty perfect 2-week trip, you might read it here) I am convinced that for “serious” sailors aluminium may be the material of choice. So it was of no question to have a longer look at Alubat´s new Ovni 450 which was displayed at BOOT boat show Duesseldorf and I might say that this boat is a real step forward for the Ovni-Range itself. Standing at the steering wheels I instantly noticed that this boat isn´t made for the easy leisure sailing in the Med, it´s made for the long trip and in this maybe for going to the higher latitudes. Everything has a firm grip, instruments are where they belong and the cockpit itself is sufficient enough to offer space, but narrow enough to as well provide safety in rough seas. The dodger on this very boat is an option, but also done with durability and safety in mind. I might say that the standard design of the boat looks much sleeker and sexier without the large dodger but I can see the definitive arguments on the pro-side to have one, especially when it gets rough and cold. 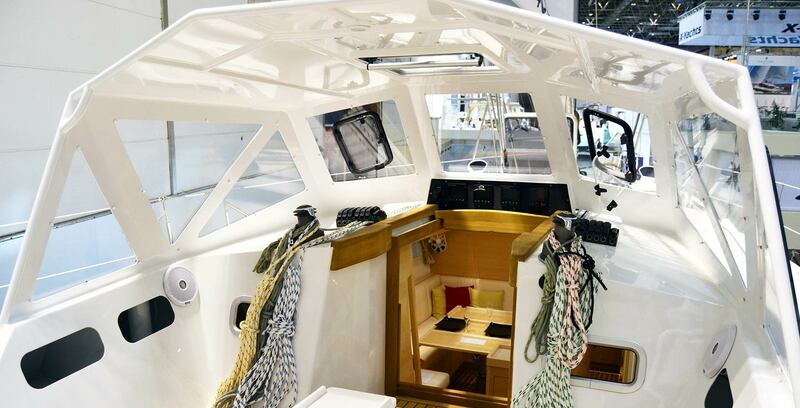 The lines and general layout of the new Ovni 450 are pretty classic: Working winches are placed under the dodger to both sides of the entryway down, Genoa-winches back aft. All in all her lines are pretty conservative, but I guess that´s because of an idea that lies behind these boats. This is what I would call a proper chart table! 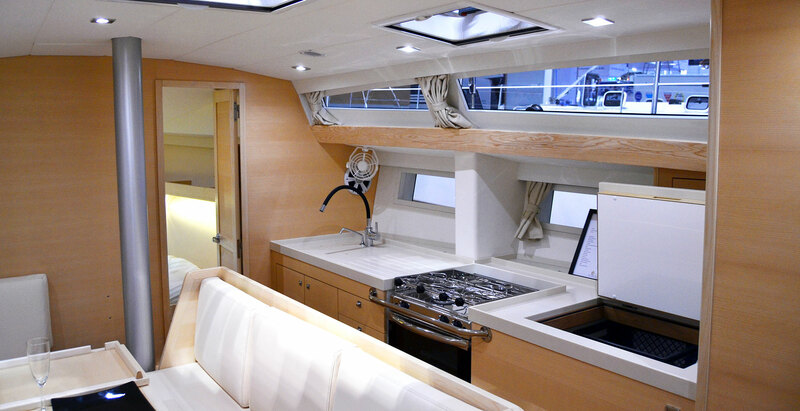 Going down and taking the navigator´s seat at the nicely done chart table I begin to understand: Ovni yachts are among the most built so called “explorer” yachts for people seeking a very special sailing experience. Ovni yachts can fall dry so that these boats are occasionally top be found in the North Sea and the tidal-hotspots of France. Ovni-owners are different. Sure. 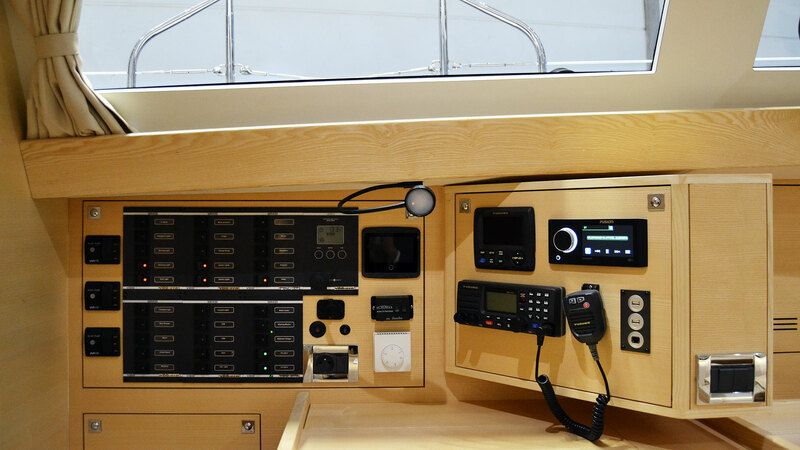 That said, another detailed look at the main switch panel and the good sized chart table reminds me of the current trend in production boat building: Reducing of the “seamanship-stuff” in favour of providing maritime chill-out zones. Which is perfectly fine since the sailing market changed a lot over the past 15 years, but it is also very reassuring to see here and there boats being made with people in mind who want more than a nice holiday – who are seeking the adventure. 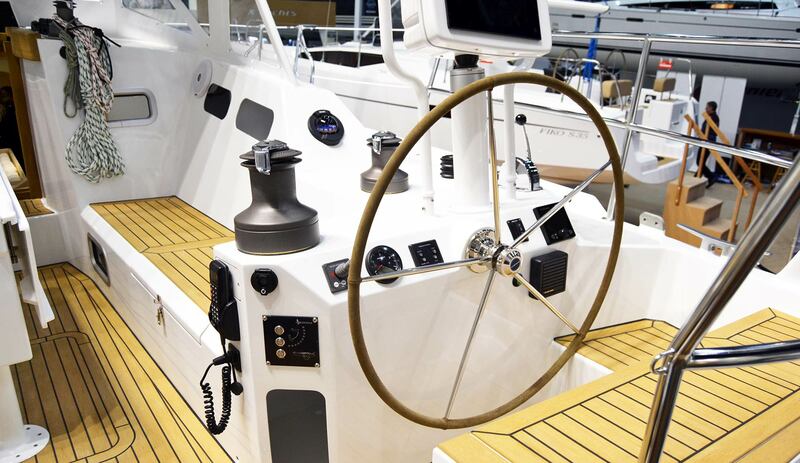 The new Ovni 450 is replacing the 445 which was one of the top-sellers at Alubat shipyard. Re-designed by renown naval architect Marc Lombard, who I had the pleasure to meet and interview a couple of times before delivered a fresh new interpretation of this yacht – with a great respect to what an Ovni owner is expecting. The boat has an overall length of 13.98 metres with a max beam of 4.29 metres. That’s a ratio of 1:3.2 which is, together with a fairly classic hull shape indicating a very comfortable motion in the seas, but certainly not high speed. Under deck the boat offers a nice salon, this time in Oak, with a cozy dining area (the table can be lowered) and the housing for the lifting keel. This housing itself functions as well as a backrest for the ship´s cook and will certainly raise safety down here. Sufficient natural light will enter the salon via 3 large skylights, the big long coachroof-windows (which are a trademark of Lombard-designs) and the hull-windows. Note the large chain plate-receivers which indicate a very stiff boat. … but why the galley to starboard side?!? 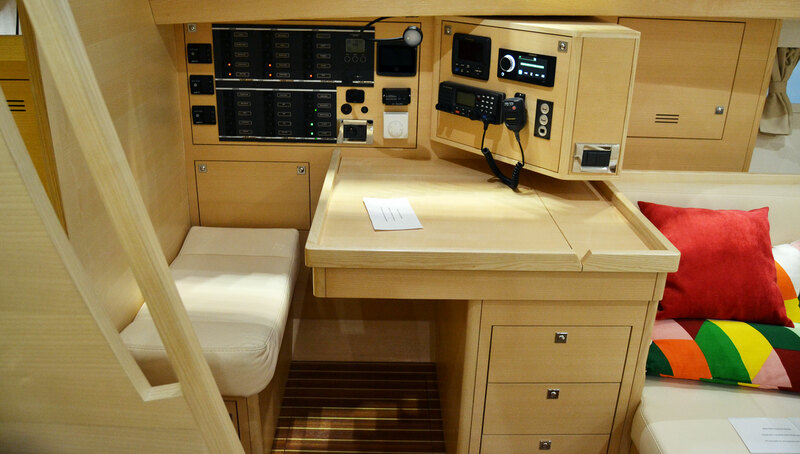 The only thing I found odd in the Ovni was the fact that the boats (by the way, in all layouts) have the galley to starboard side, which, for me, is a weird thing: A ship must have the galley on port side, this is how the tradition wants it. But I guess it was easier to have it here to have the head´s valves and pumps and stuff connected to those of the galley. Speaking of the layouts, there are no less than six(!) layouts available. This variety is due to the fact that of course the industrialization level of a yard like Alubat is lower than that of the large brands, so the ability to adapt to client´s wishes is a definitive must-have if you want to survive in the niche. 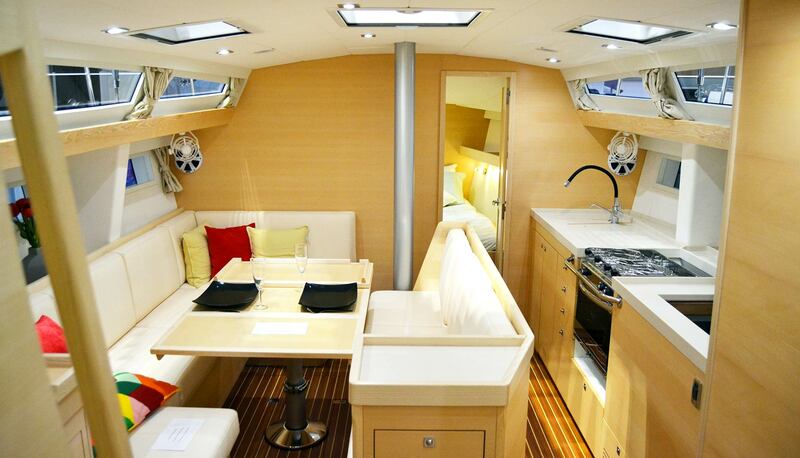 The second is that the material aluminium is so strong, that hull and deck alone is ample enough to have a stiff boat. You do not need bulkheads anymore, so they can play with layouts. 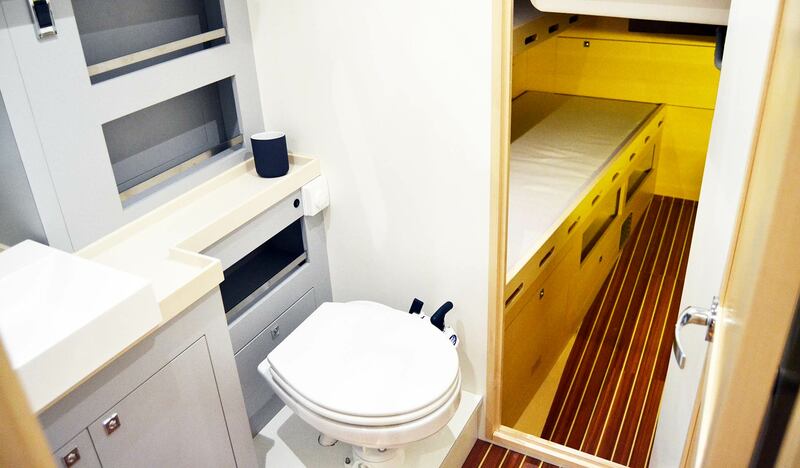 The fore cabin for example can be placed a bit rearwars, thus lessen the size of the forward sails locker, but introducing a second en-suite forward head. The head can as well be placed aft of the sails locker in the bow. You can switch the head´s mounting positions to have one on starboard and one on port side – which is great so you can choose which head is better on which tack. The aft cabin was a bit too small for my taste, which may be due to the fact that the hull shape of the Ovni 450 doesn´t carry the full beam aft. 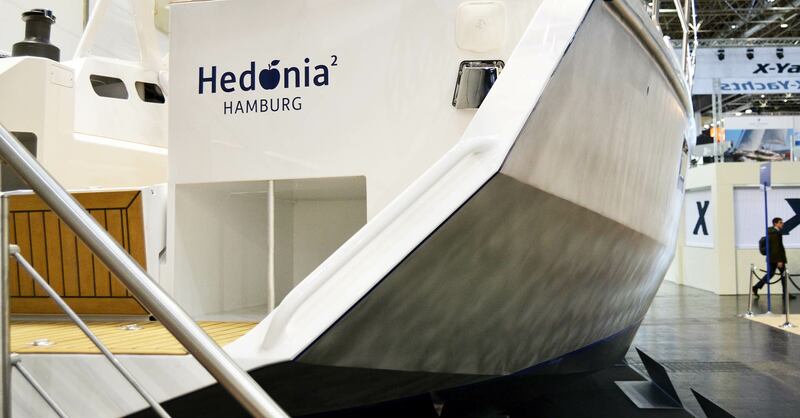 That´s a trick in other boats to increase aft cabin-size on the one hand and improve sailing abilities when running. The more classic design of the Ovni with a slightly reducing beam to the rear indicates the conservative approach with an emphasis on sailing comfort, not being as quick as possible. 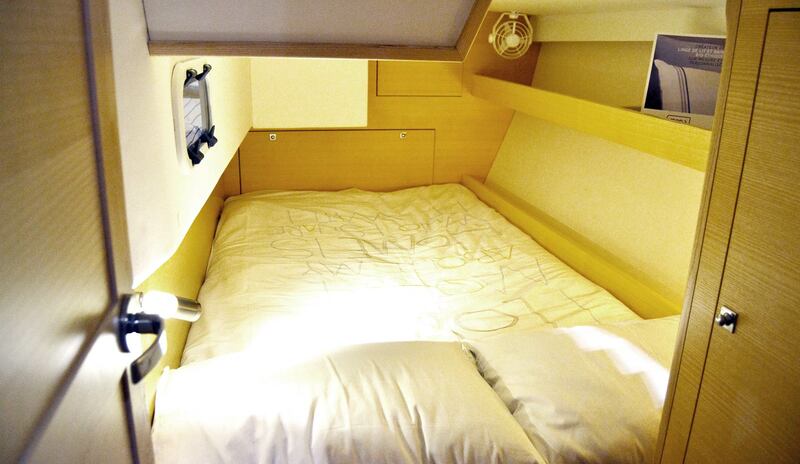 To the back the Ovni 450 features (in this version at least) a full size cabin to port side and the bathroom to port. 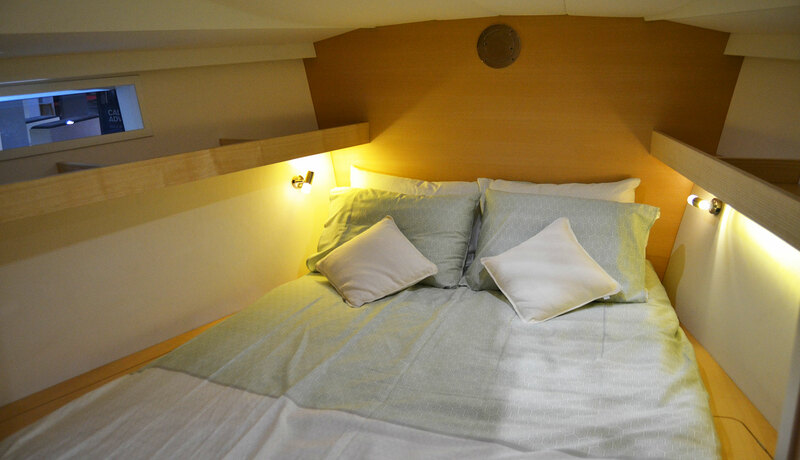 The bathroom is well-sized and it´s the only one on this boat offers all amenities a sailing couple or family wishes for. Another door opens up from here to the aft workshop, crucial for a long haul trip where a pilot berth can also be provided for a guest if surplus sleeping space in the salon is occupied. I am convinced that for the ultimate sailing adventure which brings you to maybe rarely charted areas, unknown anchorages, to regions where weather might change its face rapidly (to the worse) the boat made of aluminium is the safest and best choice to be made: The material is durable, very light and upon impact way more solid that GRP. 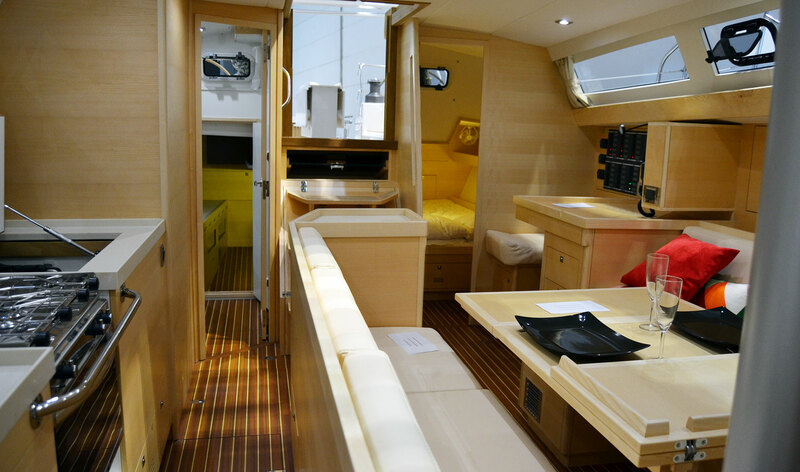 In this, the Ovni 450 will equally attract to the explorer sailor wanting to go “off the paved ways”. But there is another thing to it: Money. Hard chines: Some advantages built in. The Ovni never was and will most certainly never be the fastest of all boats. That´s due to her conservative hull shape but also due to her hard-chined construction. But is speed really of such importance for the circumnavigator with his wife and kids? The fact that the Ovni is made with a hard chine hull lowers the construction costs and makes these boats also financially attractive. In the end, welding a hard chine hull will also save time, so the pleasant anticipation to finally receive one´s own boat is shortened. The Ovni will never be my boat of choice, since I am desperately in love with Alubat´s Cigale, but I must confess she is a pretty boat. She won´t suit everybody but her design is thanks to Mark Lombard much, much more appealing than the 445 one year ago. I hope that this yacht will also have such an amazing impact for Alubat and that they may find lots of sailing families and explorers who want to set out to discover the world in one of their boats. I didn’t find much new in Ovni 450. Hope that new 400 will be something truly new. My opinion is that Ovni, as a company, has felt asleep, unfortunately…..And this terrible design of dodger – are they kidding?! ?